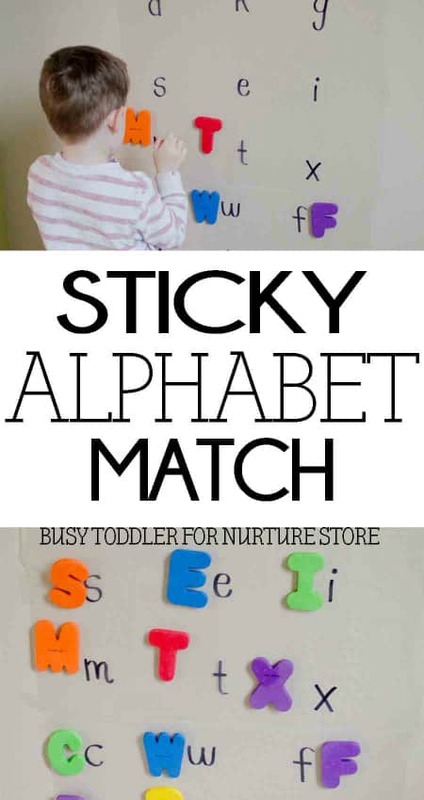 Susie from Busy Toddler joins our ABCs and 123s series today with super sticky alphabet matching game. 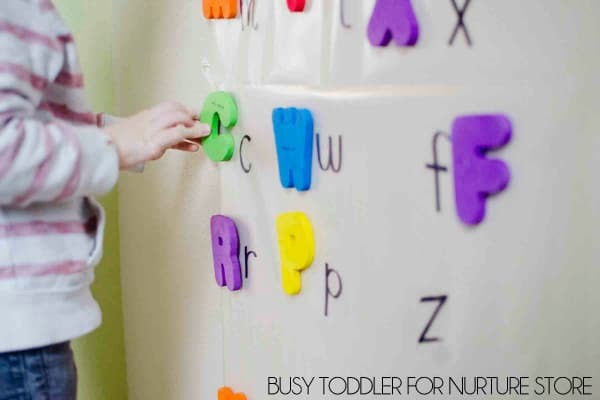 We found ourselves in a sticky situation just before nap time at the Busy Toddler house. We needed one more fun activity to finish our morning with, and good thing simple and educational play is kind of our thing. 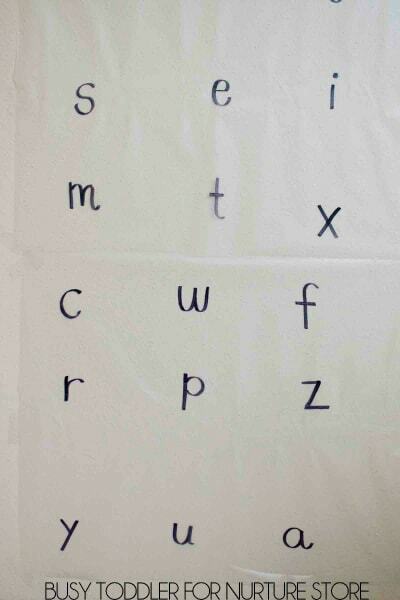 I quickly whipped up this alphabet matching activity for a little literacy fun. 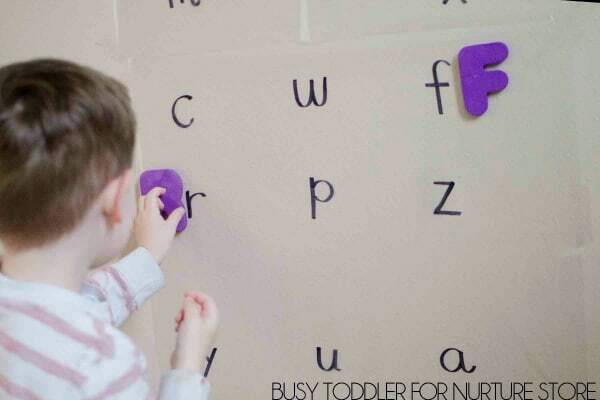 Alphabet activities are some of my most favorite activities and we do them all the time – even though my son isn’t even 3 yet. It’s never too early to introduce or practice the alphabet (says this former kindergarten teacher). Setting up this sticky activity was as simple as can be. I unrolled some con-tact paper and started writing lower case letters on the non-sticky side. Easy enough, but a few things to note: when you “unwrap” the con-tact paper to reveal the sticky side, your letters will be flipped from how you wrote them. So, you need to print them backwards – a fun little mind activity for the adult crowd! The letters I had for my son to play with were all upper case, so I decided to add a fun challenge and wrote lower case letters on my con-tact paper. The goal: match the upper case foam letter with its lower case mate. I taped the con-tact paper to the wall, presented my son with the foam letters, and away he went. This activity really stretched his recall of letters. Not only was he being asked to name the upper case letter he pulled from our “bowl of letters” but he needed to remember how that letter looks in lower case form as well. Some letters were easy, like “Ss” and “Cc”. Others, like “Aa” and “Gg”, were much trickier because they look vastly different from each other. After he finished matching the letters, we sat at this alphabet for quite a while. He found all the letters in his name and we even talked about letter sounds. A great extension for this activity would be to identify consonants vs. vowels, letters that look the same in upper and lower case form, and even noting which letters have tails (think “g” and “p”). If your child isn’t quite ready to match upper and lower case letters, consider altering the activity. With these foam letters, you could print upper case letters on the con-tact paper and have them match upper case to upper case. Matching a foam letter to handwritten letters is a fantastic options for those just learning their letter names. 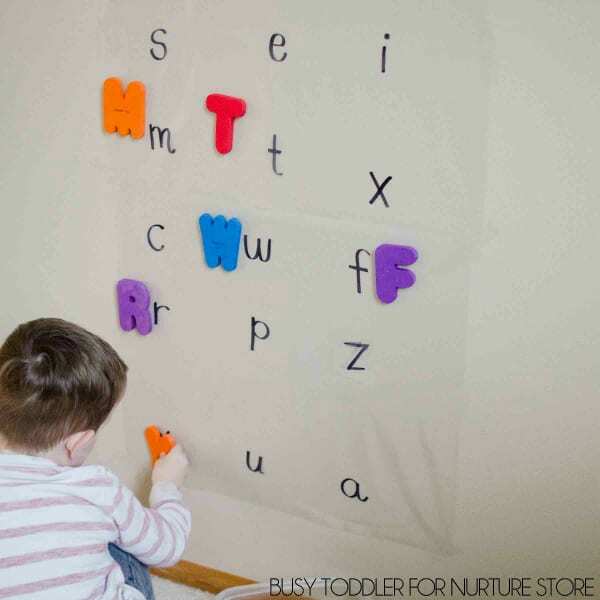 Need more alphabet activities that can be set up in seconds? Try my Letter Hunt, ABC Jello or Floating Letters activities. I’m Susie and I’m just trying to make it to nap time each day. I post easy and fun activities from mostly at-home supplies on my blog Busy Toddler. Come find me on Instagram, Pinterest and Facebook for more simple ideas.